Are you bringing a child home from another country? Are you welcoming a foster child into your life? Are you adopting an infant? 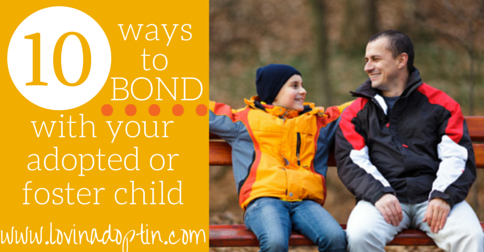 Here are some ways to bond with your adopted or foster child. 1) Rock. Rock. Rock. Rocking has been proven to help heal the traumatized child’s brain. A well-known child psychologist, Dr. Bruce Perry has done research that’s scientifically proven rocking helps heal the brain in children who’ve been neglected, abused, and traumatized. If your child can sit on your lap you can rock them. If your child is too big to rock, rhythmic movement can do wonders for them, and chances are they’ll love it. Rhythmic movement: rocking, swinging, jumping rope, jumping on a trampoline, riding a bike, swimming. 2) Carry your child in a front sling as much as possible (while cooking, cleaning, in the grocery store etc.). If your child is older see #3. 3) Make your child your sole focus for several weeks. Stay near your child as much as possible. Keep their toys near you, if you’re doing the dishes in the kitchen have an activity they can do on the floor near you. 4) Sit on the floor and play with your child. If your child is older, do what they’re interested in – make sure to have time for eye contact, but don’t force it. 5) Skin to skin connection is important for newborn bonding. If your child is older you can massage their hands. Always be aware of your child’s reaction to you. If they’ve been physically abused, this could be uncomfortable for them, so gage how they’re acting, are they avoiding eye contact? If so, start off sitting next to each other, getting to know one another. 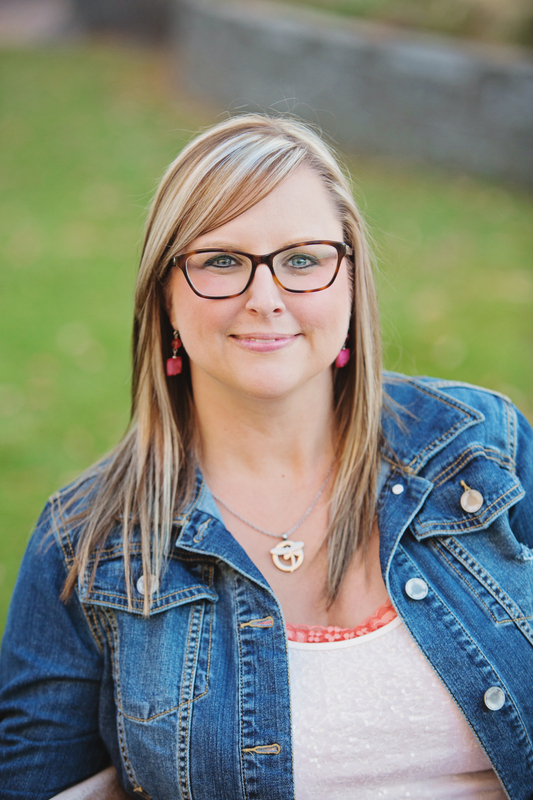 Adoptive and foster parents often want to act like they know their child’s history, but just because it wasn’t written in their file doesn’t mean it didn’t happen. There’s a lot our children go through that we aren’t aware of. 6) Keep your child’s old routines the same when possible. Implement new routines slowly. (For example, when Payton came to us she was still drinking 8 oz bottles every two-hours – she should’ve been on solid foods already – we slowly weaned her off the bottle and transitioned slowly to solid foods.) If your child is used to having a bath after dinner, keep it the same for a while. If your child was allowed to watch hours of t.v. a day, but your family doesn’t watch much, make a slow transition, don’t abruptly remove what they’re familiar with. 7) Keep calm, your voice down, and your movements precise and not alarming. A friend of mine took her foster daughter to see her biological dad for the first time after she entered foster care. This girl had been great with other men while in my friends care, even reaching out to ones she didn’t know, letting them hold her. When this girl saw her biological dad, she didn’t want anything to do with him. She even made sure to put a piece of furniture between her and him at all times. There was no report of abuse by the bio dad, but the child can tell a story through their behaviors. Again, this goes to show we don’t know everything that’s happened to our children, only they do, and we need to pay attention and gain insight from their actions. 8) When you do have to leave your child at daycare or with a relative, leave an article of your unwashed clothing with them (the scent will remind them of you). You can also leave a photo with them. 9) Give your child time to adjust to their new environment. Don’t plan big trips for several months after your child joins you, it can be too overwhelming. Be a homebody, allowing them to get used to where they now live. How do children feel who’ve moved into foster care, left everything that was familiar? What about children who’ve made several moves while in foster care? What about children who left their orphanage or foster family in another country and moved to a new country where everything is different? 10) Don’t make promises you can’t keep. Before your child comes, think of answers to questions they may ask. Will I live here forever? Will you adopt me? Will I see my birth mom again? Will you get me presents on my birthday? There may be many questions your child will ask, but think of the big ones and don’t be another broken promise. 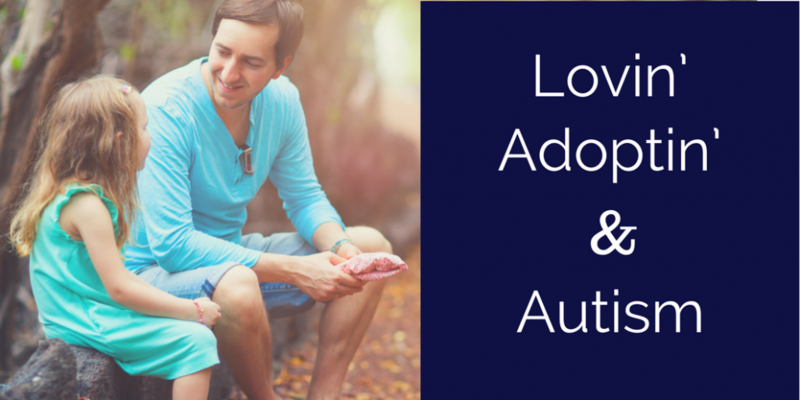 Find more posts on adoption and foster care on my CONTENTS page. You can receive each post made to Lovin’ Adoptin’ by subscribing in the upper right corner. If you’re on a mobile device this can be done on the web version. You can “like” my Facebook page and follow me on Twitter and Pinterest for more helpful information and links. 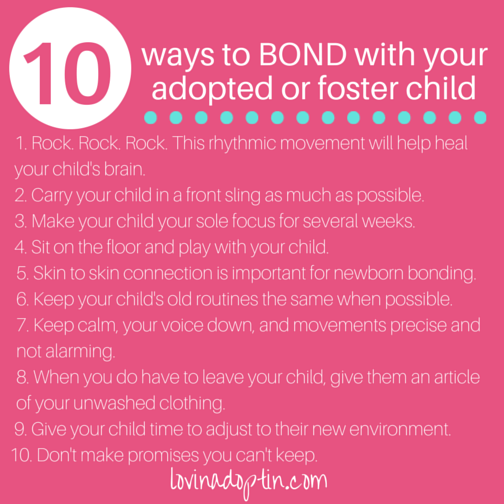 This entry was posted in adoption, foster care and tagged adopted child's attachment, bonding with foster child, how do you bond with adopted child. Bookmark the permalink.